I have one of those little ice cream machines where you freeze the bowl and then churn ice cream using a paddle attached to a small electric motor. It’s a fairly simple affair and it produces decent enough results, just not on the scale I really want. A pint of ice cream doesn’t last very long at all in our house. This sorbet lasted a little longer, mainly because it’s made out of cider and the kids were therefore banned from eating it. It’s an extremely simple recipe, which came via Elle’s New England Kitchen. Take one 500 or 568ml bottle of medium sweet cider, add a tablespoon or so of caster sugar and a good squeeze of lemon, stir to dissolve the sugar and then chill until very cold before churning in your ice cream machine. Remember that freezing mutes sweet flavours, so the mix should taste a little too sweet. It’ll mellow out as it churns. After fifteen minutes or so, the sorbet will start to look like a sorbet. A few minutes later, transfer it to a tub and freeze for another hour before beating and stirring it with a fork. Repeat after another hour or so, if you remember. The end result is a silky smooth sorbet that’s quite tart. The flavour is entirely dependent on the type or brand of cider you use…mine was quite tart and zingy. Be careful with this. I was surprised to see bottles of cider on the shelves that nudged 8 or 9% ABV. 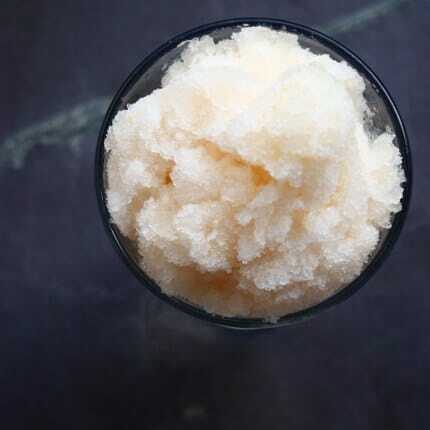 It can be potent stuff, and it doesn’t become any less alcoholic when you make a sorbet out of it. Strictly no sorbet eating and driving, please. 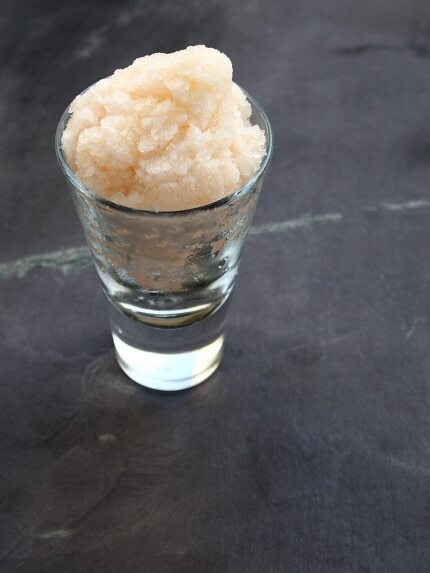 Sorbet with a kick – perfect for the holiday weekend! That sounds wonderful. I have some pear cider sitting in the fridge, so I might try this out using it. Love this. Hard cider is one of my favorite things to drink…this will great with the heat wave we're in right now. this looks so incredibly refreshing. I want some right now! thanks for sharing, great pic. That looks wonderful. I would have never through of using cider. What a great idea! Looks great and sounds refreshing. I will have to try this! Time to take out that ice cream maker. ooo, i like the mature twist of using cider, i haven't seen that before. this looks delicious! I'm very into homemade frozen treats right now and this is a fantastic, tasty idea. Great for an after dinner cooling treat. Cider must mean something different there than it does here, which is simply pressed apples. I'm thinking yours goes through a bit of a fermentation process? The sorbet must be heavenly then! Yes, cider is very much an alcoholic drink. That's interesting – I've never heard 'cider' described as anything other than a rather potent alcoholic brew! Don't think I've heard of Apple Cider with alcohol in it but what a great idea espically in this summer heat. It looks great! And thank you for the shout out, too. For those of you wondering about the cider–look for Hard Cider–I used Woodchuck, but there's many out there–Crispin and Magners come to mind. It's made from fruit and fermented for that kick of alcohol. I can't wait to try this with my homemade cider. What a cool idea. When i make cider sorbet i use maple syrup or golden syrup instead of sugar for sweetening. It is great!